Free upgrades to Windows 10 officially came to an end on 29 July, but there are ways to continue upgrading without purchasing a license. The easiest method is to take advantage of a scheme that Microsoft has in place for users of assistive technologies. As detailed here, Microsoft created a web page that allows users with accessibility needs to continue to upgrade to Windows 10 for free, but because it doesn’t require users to prove they use assistive technologies, anyone can take advantage of the free extension. When I wrote about it, I said things could go one of two ways. If the offer was abused by able-bodied customers, Microsoft might choose to end the free extension early, or the company might just keep it running for a while and allow people who were aware of the loophole to upgrade for free, and rack up some additional users. Well, it turns out that the software giant is planning to opt for the former option and end the free extension sooner rather than later. That doesn’t mean those who use assistive technologies will lose out, simply that they’ll need to request an upgrade from Microsoft’s Disability Answer Desk rather than just clicking a button. 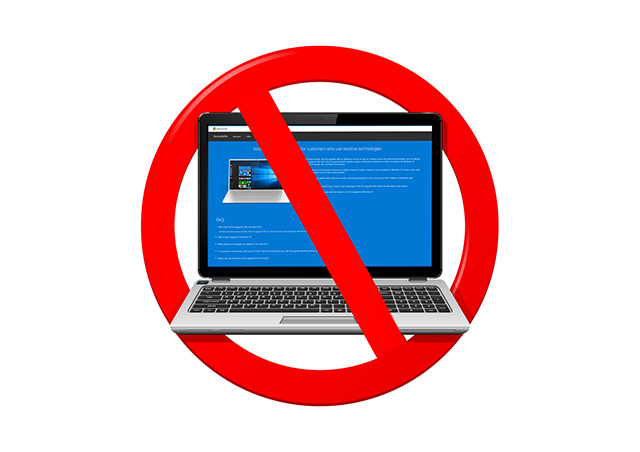 We have noticed that there are a lot of threads and articles lately regarding using a link for those requiring assistive technologies to upgrade to Windows 10 after July 29th, 2016. (I am deliberately not linking to it for reasons that will become obvious). There is some misinformation surrounding it. First and foremost, it is incorrect to state that using keyboard shortcuts such as "control+c" counts as using an assistive technology and therefore entitles you to upgrade. Microsoft have informed me that the webpage being mentioned as an acceptable reason to use the tool only refers to an example of ways to make Windows more accessible, but that is not classified as using an assistive technology that allows you to legitimately upgrade this way. As it stands, that method of upgrading is based on an honor rule. However, having spoken with MS earlier today, they inform me that within the next couple of weeks that webpage and tool will be removed and instead require you to contact MS support directly to upgrade this way. This is being done, to, (direct quote) "stop people who are currently abusing the tool". At the moment the web page is still up, and can still be used to upgrade to Windows 10 free of charge. In its FAQ Microsoft says that it will make a public announcement prior to ending the offer, and while it hasn’t yet done so, time is clearly ticking. If you use assistive technologies and want to upgrade to Windows 10 for free, you should act quickly.